The ongoing court proceedings of Nnamdi Kanu is marred by violence and angry looking DSS who has sworn into actions by intimidating and harassing journalists from covering the court proceedings. A DSS whose identity is been shielded pushed and slapped a reporter who tries to make his way inside the court room. The high rate of intimidation and abuses of the right of journalist currently going on in the federal high court Abuja is condemnable. 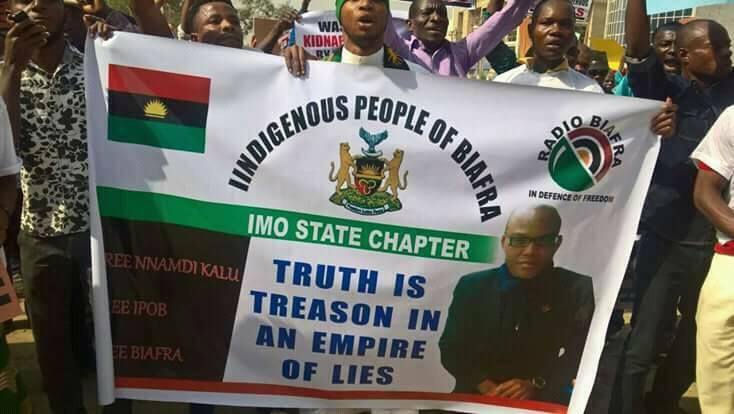 Meanwhile, Over Hundreds of IPOB enjoined are Journalist, Reporters, and observers are currently staging a peaceful protest outside the court premises. Most of the international observers are currently at the federal High court to witness the brutality and unprofessional display of the DSS. There is no freedom of press in the zoo called Nigeria. It is a land of impunity. Biafra will make the difference very soon.